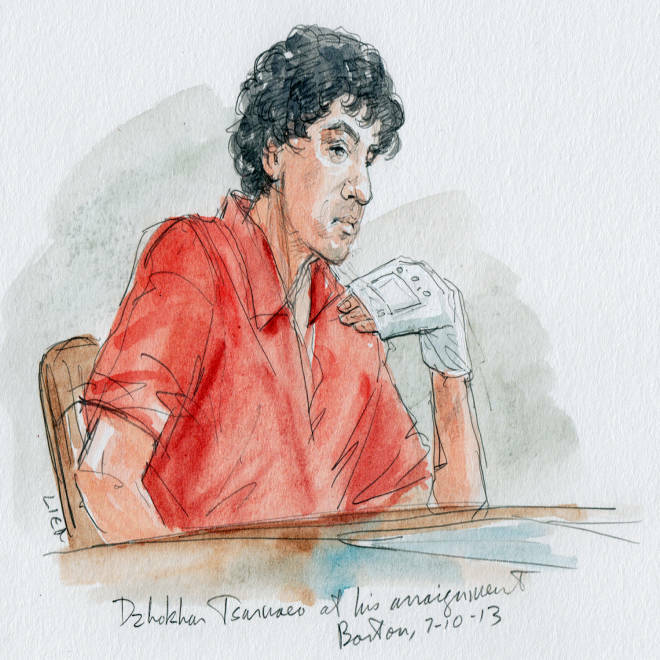 Dzhokhar Tsarnaev holds up a bandaged hand at his arraignment on Wednesday. Friends and family members of people whose lives were shattered when two homemade bombs went off near the finish line of the Boston Marathon on April 15 packed three rooms in a federal courthouse on Wednesday as suspect Dzhokhar Tsarnaev pleaded not guilty to a 30-count indictment. But the fleeting courtroom encounter brought little relief to Bostonians who said the 19-year-old —accused of conducting the deadly bombings with the help of his older brother Tamerlan Tsarnaev —showed little feeling. Tsarnaev, seated between his lawyers in an unbuttoned orange jumpsuit and black t-shirt with a bandage around his left hand, responded “not guilty” to each of the charges read against him in court. At times he stroked his chin, smiled crookedly, and appeared to look calmly about the courthouse. 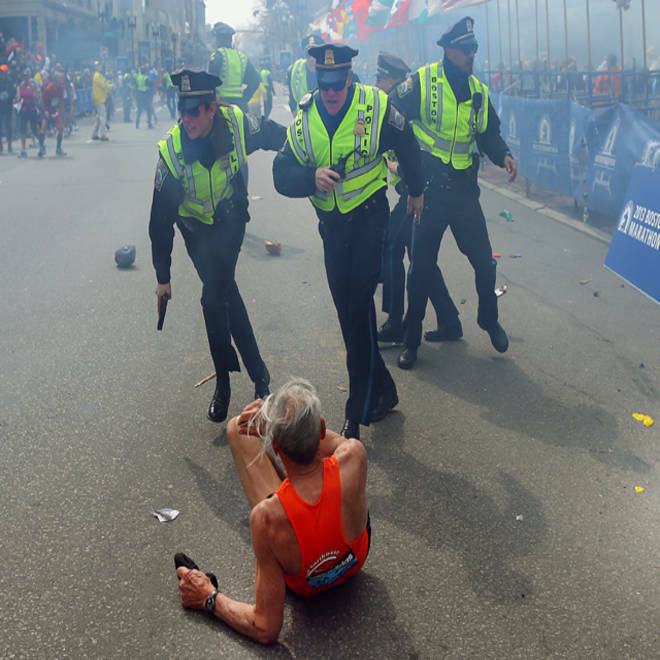 Fucarile wore a Boston Strong t-shirt with the name of Marc Fucarile, his son who lost his right leg and still carries shrapnel in his body, the father said. Marc Fucarile, 34, was standing near the second blast when it went off. He still has more surgeries to go, and has spent every day of the nearly three months since receiving medical care, his father said. Members of the family have taken weeks off work so that someone is always at Marc’s bedside, he said. 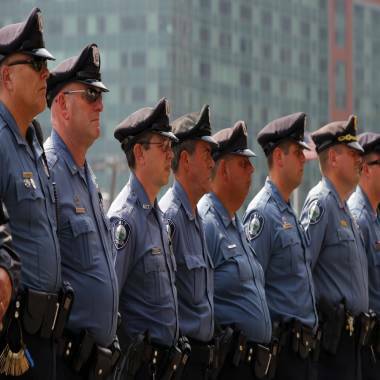 Massachusetts Institute of Technology (MIT) police officers stand outside the federal courthouse for the court appearance by accused Boston Marathon bomber Dzhokhar Tsarnaev in Boston, Mass., on July 10. Mildred Valverde, 44, after coming out of the courthouse on crutches, said the hearing was emotionally taxing. “Just to be in the same room with him was bothersome,” Valverde said, adding that she hopes that, if convicted, he doesn't get the death penalty. "I'd rather see him suffer," she said. "Death is too quick." Scores of survivors and their supporters crowded into two overflow rooms in the courthouse to watch Tsarnaev’s appearance on television screens. About 30 more, including some who stood glaring with their arms crossed as Tsarnaev was led from the courtroom by U.S. Marshals, filled seats in the main courtroom. It was the alleged bomber’s first court appearance since he was captured by law enforcement, bloodstained and hiding in a boat, on April 19. Among those present was Liz Norden, whose sons J.P. and Paul Norden each lost a leg in the April blasts. “I felt sick to my stomach,” Liz Norden told dozens of reporters outside the courthouse after the hearing. Asked what she would tell her sons about the day, she said they have focused all their attention on recovering from their injuries. Victim and family members of the Boston Marathon bombing describe the proceedings of the Dzhokhar Tsarnaev court hearing. Peter Brown, the Norden brothers’ uncle, said he did not expect to feel anything when he saw Tsarnaev in court. Three people were killed and more than 260 injured in the bombings that shattered a beloved springtime rite in the city. The deceased were Martin Richard, 8; Krystle Marie Campbell, 29; and Lingzi Lu, 23. Also killed in the course of the manhunt after the bombing was Sean Collier, 27, an officer with the Massachusetts Institute of Technology police department who was shot dead in his patrol car on April 18. Liz Norden, the mother of two men who each lost a leg in the Boston Marathon bombings, tells WHDH "I want to know what happened that day," as she prepares to attend a federal hearing for suspect Dzhokhar Tsarnaev. Janet Wu reports. Nearly two dozen representatives of the MIT campus police department arrived at the courthouse before the hearing and remained outside, in uniform and attention, until after it was over. “I didn’t see a lot of remorse. I didn’t see a lot of regret,” MIT Police Chief John DiFava, who was in the courtroom, said after the proceeding. Tsarnaev's sisters were also in the courtroom, and at least one of them was crying. Outside, a small group of supporters cheered as a caravan carried him past, invoking his nickname as they yelled "Justice for Jahar!" according to the Associated Press. Prosecutors said they expect the trial will last three to four months and they anticipate calling 80 to 100 witnesses. The next court date is Sept. 23. Attorney General Eric Holder has not yet decided whether to seek the death penalty for Tsarnaev, an ethnic Chechen and American citizen who was born in Dagestan. Investigators say the motive for the bombing might be found in anti-American messages the college student scrawled in the boat where he was found April 19: "The U.S. Government is killing our innocent civilians," "I can't stand to see such evil go unpunished," and "We Muslims are one body, you hurt one you hurt us all." After the FBI identified the brothers as the bombing suspects, they embarked on a bloody escape bid — allegedly executing Collier, hijacking a car and hurling pipe bombs at police. Tamerlan Tsarnaev was killed in a firefight, but Dzhokhar fled and remained at large during a daylong lockdown that ended when a Watertown, Mass., homeowner noticed blood on the boat in his backyard. The suspect was taken from the boat to a Boston hospital where some of his victims were still recovering. He was later transferred to a federal prison with medical facilities. Explosions at the finish line of the Boston Marathon killed three people and led to a massive manhunt as police locked down the city.